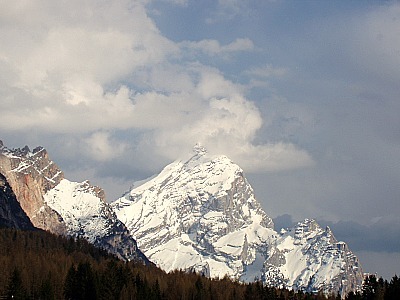 The Monte Antelao (‘Nantelòu’ in the dialect of Cadore) – also known as the ‘King of the Dolomites’ – is the second highest summit after the Marmolada, peaking at 3,264 m. It is the first, though, as for the relationship between its height and the horizontal development of the base, thus forming one of the foremost groups of the Dolomites (below, the Antelao seen from Vodo di Cadore, in the Boite Valley). The group is formed by a central massif dominated by Monte Antelao itself, which is flanked by a further series of peaks aligned W to E, such as Punta Menini (3,177 m), Punta Chiggiato (3,163 m) and Cima Fanton (3,142 m) – among many others. Despite its substantial individuality when viewed from a distance, this mountain takes on unique ‘faces’ when seen from different angles. For instance, from Centro Cadore it has the appearance of a bulky, powerful castle, while from the central section of the Boite valley it looks more decidedly like a pyramid. From Cortina the Antelao is a neat triangular shape in the distance, with a little rectangular 'house' on the top that towers above the valley (see image below). 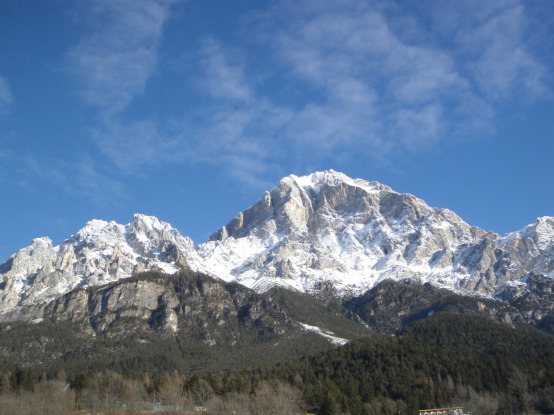 However, the Antelao is not just the highest peak in Cadore and its undoubted symbol, but also a massive complex, articulated in gorges, canyons and pinnacles on all sides. This mountain group conceals two small glaciers, the Upper – Superiore, aka ‘Orientale’ (Eastern), second for its extension in the Dolomites – and the Lower (Inferiore; also called ‘Occidentale’ – that is, Western). The two are separated by a rocky crag that protrudes towards the Val d'Oten, which culminates on the ridge of the Cime Cadin. Both glaciers are in stark regression (the ‘Superiore’ is about 27 ha, while the ‘Inferiore’ is just 14 ha), and some scientists forecast their total disappearance by the end of the 21st century. Both glaciers have lost above 100 meters along their fronts in the period 1981-2009, so that their shrinking is evident – especially when comparing their actual appearance with past accounts or descriptions. Both glaciers are in the municipality of Calalzo di Cadore, whose drinking water comes from them; a third glacier (the Cianpestrin) is all but disappeared. The southern aspect of the mountain is characterized by the very steep – and deep – Valón dell'Antelao, which is visible from Monte Rite; the western aspect, on the contrary, is defined by a massive rocky bank known as ‘Le Laste’. Two longer valleys descend on the NE side, crossed by streams of glacial origin – the Val d'Oten and Val Antelao, occupied in part by rich meadows. 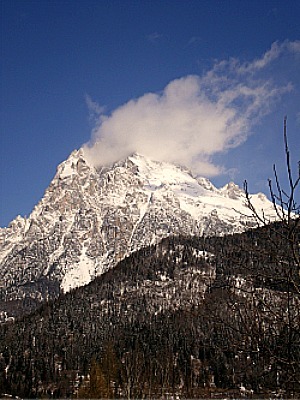 The top – even on clear days – is often shrouded by a crown of clouds, so that in Cadore there is a saying according to which the Antelao is ‘smoking the pipe’ (see image below). The summit was conqured for the first time in 1850 by a local hunter from San Vito di Cadore, Matteo Ossi, who then repeated the enterprise when accompanying the Austrian Paul Grohmann – one of the foremost mountaineers of its time, who reached the top in 1863. The Englishman John Ball overestimated the difficulty in conquering the ‘King of the Dolomites’, so he preferred to climb the Pelmo instead; in this way, he was the first to ever ascend on this other Dolomite giant facing the Antelao just from the opposite side of the valley. For its location and history, the Antelao is quintessentially a mountain of the Oltrechiusa (the section of the Boite valley between Vodo di Cadore and San Vito di Cadore), and it is well established in the shared imagination of the local people. Numerous are the landslides that have precipitated, over the course of the centuries, from the southern slope down on to the valley floor. Memories transmitted over the centuries go as far back as 1348, when the legendary village of Villalonga (of which, however, there is no evidence in the documents) was allegedly destroyed by a landslide originated by an earthquake (which really happened, however, and devastated the village of Lozzo di Cadore). Still, in 1629 a landslide swept away the northern part of the village of Borca di Cadore – the most recurrently damaged township in the Valle del Boite. Further landslides took place in 1737 and 1814; these, being nearer in time, are well documented: the second event was particularly devastating, as the hamlets of Taulèn and Marceana were destroyed, causing 250 victims. This was actually the most ominous natural disaster to be recalled in the history of the Dolomites, which left an indelible scar in the history of the whole valley. Above the destroyed hamlets a new settlement called Villanova (=new town) di Borca was later erected. The village of Cancia was also repeatedly affected by landslides over time; for instance in 1868, then again – more recently – in 1994, 1996 and the latest time in July 2009, when 20,000 cubic metres of mud and gravel precipitated during the night following heavy rainfall, causing two casualties. The panorama from the top is breathtaking, but it is hard-earned – and it is certainly not something to be attempted for by the average trekker. Even from further down, however, the views abundantly pay off for the effort of climbing. In clear weather, the Adriatic sea and Venice are distinguishable; some say that even from Venice itself – especially on clear winter days – it is possible to spot the ‘King of the Dolomites’ towering over the lagoon. It is generally agreed that from the mountain’s southern basin descend the waters that go on to form the small ‘Laghetto de la Femenes’ (the 'Lake of the Women'), by the archaeological site of Lagole in Calalzo di Cadore, while on the Antelao itself also takes place the legend of the Wedding of Merisana – one of the many enchanting Dolomites’ stories. The Rifugio Galassi (2,018 m) is one of the functional bases that can be used for more prolonged or demanding excursions on the mountain’s upper reaches. From there, one can gain the summit in 4 hours, but as anticipated earlier, this is not something for everyone, and the ascent should not be attempted unless one is an experienced mountaineer/rock climber (also, to make things more challenging, near the summit there used to be a bivouac – the Piero Corsi – which has been declared out of use since 2011). On a much more approachable note, the Galassi mountain hut can also be used as a base for excursions along the ‘Alta via n. 4’ and ‘Alta via n. 5’ ('Alpine Highways' Nos. 4 and 5), which both pass through the area. Other useful mountain huts on the slopes of the mountain include Rifugio Antelao (1,796 m) and Rifugio Chiggiato (1,911 m). However, several pleasant excursions can be had in the area without even venturing on higher ground. At lower levels, for instance, there are a few useful mountain huts: Rifugio Costapiana (1,610 m) is accessible from Valle di Cadore, and allows for a nice and not too difficult ascent. It is always possible to continue higher up, and reach the small church of San Dionisio, which is connected with further trails leading up in altitude. The Rifugio Capanna degli Alpini (1,395 m) can be reached from Calalzo di Cadore a﻿long the solitary Val d'Oten, which is almost carved between the mighty walls of the ﻿﻿﻿﻿﻿Antelao on one side and the jagged peaks of the ﻿Marmarole (2,932 m) on the other. In the vicinity of the mountain hut, there is also a picturesque waterfall, the 'Cascata delle Pile'. Lastly, the Rifugio Prapiccolo (1,366 m) is accessed from ﻿Pozzale, a hamlet near Pieve di Cadore﻿, and also from there it is possible to connect with paths leading further up in altitude towards Rifugio Antelao and beyond.